Suffolk User Forum (SUF) is a service user-led mental health charity. We work with mental health service users, patients and family carers. We listen to and value peoples lived experience of services and support, anonymously sharing feedback to support commissioners and service providers, to make developments that enable positive change and improvements to emotional well-being, mental health services and support community resilience. Where people are keen to be involved, we support them to work together with commissioners and providers to coproduce improved care pathways and community support. …share yours and together we can make a difference! Current mental health developments that SUF is supporting and informing through sharing your lived experiences. Improving Emergency and crisis support pathways for people in very high levels of emotional and mental distress. Improving referral pathways for mental health care assessment. Developing improved care pathways for community mental healthcare, which is currently provided by the Norfolk and Suffolk Foundation Trusts Integrated Delivery Teams. Developing a crisis cafe for people in Suffolk. The development and delivery of the Suffolk wide suicide prevention strategy called Suffolk Lives Matter. The development and project planning for the suicide strategy within Norfolk & Suffolk Foundation Trust. The development of a more joined up care and treatment opportunities for people living with personality disorders. 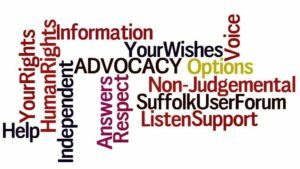 Support for you through Informal Mental Health Advocacy – working as a partner within Total Voice Suffolk, SUF is providing informal mental health Advocacy. By providing information we enable service users and their family carers to know more about their rights and choices in mental health care and support. James our Mental Health Advocate is providing weekly Advocacy Drop-in sessions on 3 acute inpatient units in Ipswich (Avocet, Lark & Poppy wards) and from 6th June 2017 in two acute wards (Abbeygate and Southgate) n Bury St Edmunds. Examples of the range of issues the SUF Informal Mental Health Advocate can support people with. Know their rights as a Detained Patient. Have information about how to Appeal against a Section. Supporting people to know information about their care plan. This can include confirmation they have a care plan, confirmation that amendments have been made as requested. Confirmation and details about care plan reviews. Supporting people to have information about their request for authorised leave and confirmation that authorisation has been granted. Supporting people to make complaints and where necessary referring onto to TVS partner for NHS Complaints. Supporting people to understand more about their one to one time on the ward. Evaluating risk and making Safeguarding referrals where appropriate. Supporting people to have information and advice about their medication and confirmation of appointments and the outcome of test results. To other agencies and community resources for discharge planning, peer support or Local Area Coordination. Supporting people to navigate for positive outcomes with other professionals, including care coordinators, support workers etc. Supporting people to know their choices and options for planning to return to work, including re-gaining self-confidence and new skills. Supporting people to know and understand their choices and options regarding a number of housing and housing related issues. For Independent Mental Health Advocacy (IMHA) and Independent Mental Health Capacity Act Advocacy (IMCA). Please do share your feedback about mental healthcare so that together we can make a real difference in Suffolk. Online through this website – contact us page. Alternatively go to our Events Page to find dates when SUF is visiting in your area. In addition to the core aims of SUF, we have individually funded projects. SUF’s DVD project called “Behind the Curtains” is the personal experiences of SUF members discussing how mental health problems have affected their lives and what they have been able to do to manage the effects on their wellbeing. The project consists of a two part DVD, a booklet of associated life stories with an introduction on ‘recovery’ and notes with suggestions on how the information can be used. It is relevant to service users, mental health professionals, and all organisations highlighting the importance of mental health and its relationship to a person’s wellbeing. This project was funded by a grant from Awards for All (Big Lottery) and NSFT. 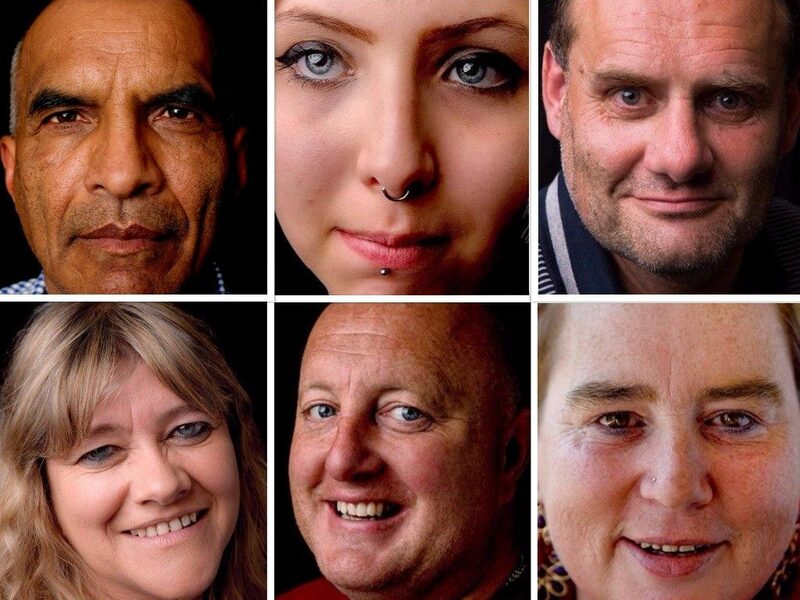 SUF’s DVD “Sticks and Stones” is a recording of current mental health service users talking about everyday language, how it can hurt and impact on their wellbeing. This was first shown at the St Audrey’s project at East Anglian Museum of Daily Life.